Print Pyromania Pottery - Parksville & District Chamber of Commerce, Parksville, B.C. • Join the Chamber Today! 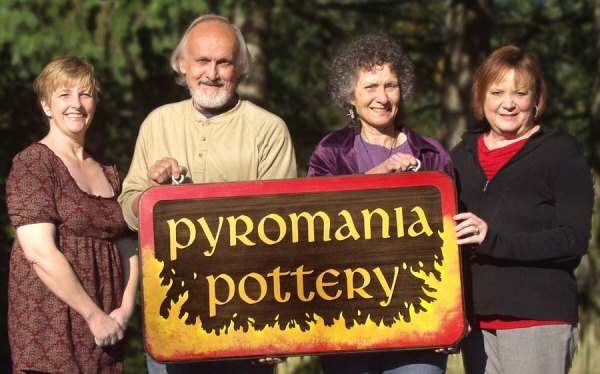 Pyromania Pottery, located "behind the goats" at the Old Country Market in Coombs, is a collective pottery which showcases the creations of six local artists - Algys Bubnys, Les Crimp, Trudy Menzel, Jane Murray-Smith, Linda Philips & Donna Rankin. The work ranges from beautiful functional ware for everyday use to unique raku pieces to feast the eyes. In addition to the pottery, there are photos, cards, watercolours and jewelry. A great place to shop in any season, for any reason!